Summer Worship at 10:00 a.m.
From Memorial Day to Labor Day we worship together at one summer service at 10:00 a.m. Adult Sunday School is at 9:00 a.m. during the summer. 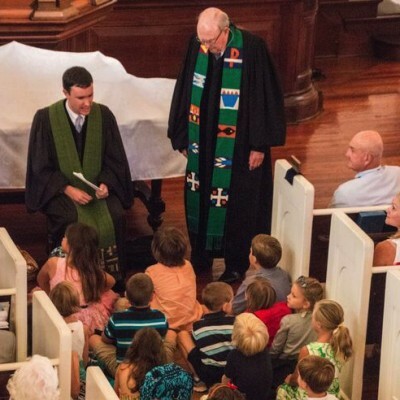 Children are always welcome in worship. Nursery is provided for infants-2 year olds during both worship services and Sunday School. During both services there is a special Time for Children after which children through kindergarten may go to nursery as well. For more information on Sunday morning child care, see our Children’s Ministry page. Everyone needs to be fed! Come meet us at the Lord’s Table during our mid-week worship, half-hour service of communion on Wednesday nights at 5:30 p.m. (from mid-September to mid-May) for spiritual nourishment, and then join us for table fellowship at Wednesday night supper. On the first Wednesday of the month, we worship in the reflective Taizé style which emphasizes simple, meditative music, scripture readings, prayer and silence. On the remaining Wednesday evenings, we follow a service of evening prayer. This is your invitation to “Come to the Table!" We’d love to host you for dinner!